Historical Biographies, Nova Scotia: Peregrine Thomas Hopson (?-1759). We known little of Hopson's earlier life except that which we might extract from his military records.1 He shows up as being appointed, in 1703, a lieutenant in Lord Shannon's marines; in 1711, he was made a second lieutenant, Grenadiers. In 1738, we find that Hopson was then in the 14th foot (Clayton's). His career continued to advance such that he was made a lieutenant-colonel of the 48th Foot (Chomondeley's), a position he was to hold from 1741 through to 1743. At some point, I do not know when, he was put in command of the 29th Foot (Fuller's) and was to be made its colonel in 1748 and was to continue as its colonel until 1754. A substantial amount of Hopson's career was spent at Gibraltar. He apparently was there in 1727, and, according to the DCB, was there, except for a stay in England from 1741 to 1743, throughout from 1727 until a challenging appointment was to came along in 1745. Hopson's entry into the history of Nova Scotia occurs when he arrived with the "Gibraltar troops" sent to relieve the English garrison at Louisbourg during April of 1746. He was, as we have seen, at that time, in command of a regiment, the 29th Foot (Fuller's).2 Hopson, therefore, was at Louisbourg during most of that period, 1745-49, when it was occupied by the English. Indeed, in September of 1747, Hopson took over the command of Louisbourg, replacing Charles Knowles. In one of the settling terms of the treaty which concluded the War of the Austrian Succession (1744-48), Louisbourg was to be returned and it was Colonel Hopson, who, on July 12th, 1749, greeted the returning French and saw to the turnover. Hopson, then, with his two British regiments that had been stationed at Louisbourg sailed down the coast to join Cornwallis, who had founded Halifax but a few weeks earlier. No longer needed in America, likely with the fall sailing of 1749, Hopson returned to England. However, three years later, the authorities fully appreciating Hopson's experiences at both Louisbourg and at Halifax, still the colonel of the 29th Foot, was appointed to go and to take over from Cornwallis. On August 3rd, 1752, Cornwallis was grateful to hand over the reins of governorship to his replacement.4 Hopson was to immediately have his hands full and faced civil unrest at Halifax as there was conflict between the newcomers from England and the newcomers (who didn't think themselves to be so new) from New England. As it happened, Halifax was a magnet to certain New Englanders who flocked in to sop up the government money being spent to support the new colony. Hopson writes their Lordships: "... almost from the beginning of the Settlement there has been great Jealousy and Animosity between the Settlers that were sent from England and those who came here from different parts of the Continent of America ..."5 Hopson soon came to realize that the settlers who were simply hanging on in Halifax had to be set up in a situation which would put them at some distance from government provisions; but, one, which would allow them to fend for themselves in the business of fishing and farming, activities, for various reasons, which were not too easy to pursue in the new capital at Halifax. In 1757, Hopson10 was back at Halifax, in connection with a new war which had broken out between England and France, The Seven Years War. The Earl of Loudoun had been appointed as the commander in chief of the English forces in North America and his orders were to defeat the French in America. His mission was to begin at Halifax where there was to be a convergence of English forces. On June 30th, Loudoun came up from New York with troops and supplies; and, Admiral Holburne came in a few days later directly from Briton with "eleven ships of the line and six thousand soldiers. "11 These soldiers (many of whom were newly recruited Scots) were under the joint command of Colonel Hopson and Colonel Richard Lyttelton.12 That summer, in 1757, at Halifax, the English had a combined force which included 12 thousand men and 16 ships of the line. William Pitt, who, by then, had the conduct of the war totally in his hands wanted these forces, after a few days rest, to proceed on its mission. Its mission was to first take Louisbourg; and then after that, if possible, to carry on to Quebec. "Loudoun proceeded upon his preparations with traditional and pedantic accuracy, drilled the young troops, and re-embarked eventually, after four weeks' delay, at the beginning of August. ... When the ships were on the point of weighing anchor news arrived that the squadrons sent out from France in the spring had reached Louisbourg, and had increased the force in that town to some twenty thousand men, with twenty-two ships of the line. 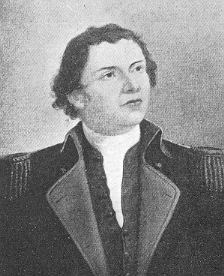 "13 Much to his discredit (he was recalled to England the following year) Loudoun had declared a siege impracticable, disembarked the troops, and returned to New York.14 As for Hopson -- though most of the troops were to winter over at New York, some stayed over at Halifax -- he likely went back with a contingent, that fall, to England. "Biographical Directory" as contained in The Royal Navy and North America (London: Navy Records Society, Vol. 118, 1973) at p.432 & DCB. Being in the Grenadiers meant that Hopson was a large man. See Harry Piers' article as contained in NSHS#21, p. 131. )The "Gibraltar troops" arriving at Louisbourg, 1200 or so, were made up of two regiments, the 29th Foot under Hopson and the 56th Foot (Warburton's) under the command of Lieutenant Colonel John Horsman. Haliburton, History of Nova Scotia , vol. 1, p. 317; Brebner, New England's Outpost , p. 186. As quoted by Brebner, op. cit., at p. 246. DCB, v. iii, p. 295. This treaty lasted; and, indeed, in our times, was upheld by the Supreme Court of Canada in R. v. Simon (1985), 71 N.S.R. (2d) 15. Hannay, The History of Acadia , p. 374. I am not aware of Hopson's movements between 1753 and 1757. I assume he was to remain in England. His medical problems must have subsided, for, in 1754, he was switched from the colonel of the 29th to the 40th Foot. McLennan, Louisbourg , p. 203. Von Ruville's biography on Pitt, (London: Heinemann, 1907) vol. 2, p. 84. William Pitt was the strong man in England and his choice was the son of his old school chum, Lyttleton. Plainly, Newcastle, Pitt's political opponent, who had the ear of the king, wanted Hopson. I believe Pitt thought Hopson, while a capable officer and with much experience, especially in Nova Scotia, to be too old for this important command. However, a compromise was worked out for a joint command. After the failure of the 1757 expedition; Pitt, was to have his way. He cleaned out the top command for the new effort in 1758 and made the personal choices of Amherst and Wolfe. See, further von Ruville's reference to his dislike of Hopson in the fn at p. 224. Von Ruville, op. cit., vol. 2, p. 156. The DCB reports that Hopson "fully concurred in Loudoun's decision to abandon the expedition because of the late arrival of the British troops and the strength of the French fleet at Louisbourg." DCB reports that Hopson in his will, drawn up a month before he left for Martinique, had provided for a niece, Lydia Goodall, who was living with him at Berry, near Gosport, Hampshire; and, two sisters, Grace Hopson and Anne Bennett. This, of course, supports the theory, though we know nothing of his private life, that it is likely Hopson was a life long bachelor.